Elizabeth Cecilia Douglas Clephane was born in Scotland in 1830 and died in 1869. The daughter of a county sheriff, she lived most of her brief life near Edinburgh. 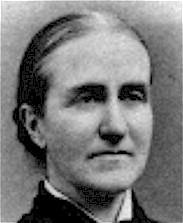 Contained in the same collection was her famous narrative poem, “There were ninety and nine that safely lay.” Both of these hymns were promoted by the well-known American musical evangelist and songwriter Ira D. Sankey (1840-1908), who published them in his Sacred Songs and Solos (1873). Though Sankey composed a tune for the song entitled CLEPHANE, the almost universal pairing is with ST. CHRISTOPHER, composed by Bristol, England, musician, Frederick C. Maker (1844-1927). The hymn is full of comforting, and perhaps paradoxical language, about the cross, after all, an instrument of the cruelest torture. These include in stanza two “the shadow of a mighty rock,” “a home within the wilderness,” “a rest upon the way.” An omitted third stanza provides additional images of consolation: a “happy shelter,” “refuge tried and sweet,” a “trysting place,” and “a ladder up to heaven,” a reference to Jacob’s ladder. a ladder up to heaven. Such explicit anticipation of and longing for death may seem somewhat morbid today, but echoes the Romantic literary sentiment of her time. Though appropriately sung during Lent and Holy Week today, this hymn is more of a personal meditation on the cross and one’s own mortality than a hymn written for a specific time of the Christian Year. The purpose of this comparison is not to ascribe a higher quality to one hymn over another, for both bear faithful witness to an encounter with the crucified Christ. The purpose is to demonstrate the difference between the early eighteenth century theological perspective of Isaac Watts and the spiritual encounter of a woman during the Romantic era of literature 160 years later. Elizabeth Clephane’s reflection assumes a spiritual posture of meditation. Unlike what she states in her final stanza, “Content to let the world go by. . . :, this was not her ethical posture as she was not only aware of others’ plight, but also shared all she could spare to meet the needs of the poor and infirmed within the limitations of her frail health and resources. Given the rich symbolism that is part of the cross in Christian experience, we need to sing both of these hymns as well as many others on this theme.